I selected the Bushnell Pro 350 lumen light for my particular needs. EDITOR’S NOTE: BlueSheepdog does not sell advertising, and we are not affiliated with any product manufacturers. This allows us to provide unbiased, objective reviews, without the pressures from external sources. We do participate in the Amazon Affiliates program. When readers click on a product links in our posts, and make a purchase, Amazon compensates us with a small percentage of the sale (without changing the price you pay). These sales are what keep this site active, so thank you in advance for any clicks or purchases you make! These Bushnell Pro flashlights are built with aircraft-grade aluminum housings, and are paired with advanced circuitry for dependability and longevity. Like many “tactical” flashlights, the Bushnell Pro flashlights offer lighting settings of low, high and strobe. 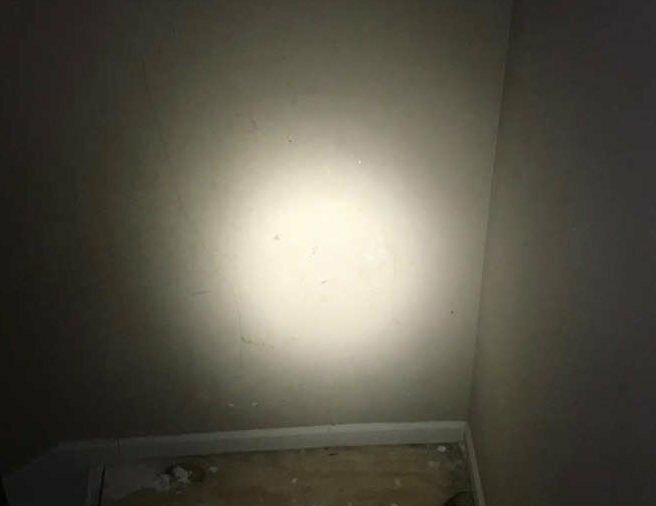 We have written about the strobe function on flashlights before, and if used correctly, can be a powerful tool in search and seizures on the streets. Bushnell Pro lights use the latest Cree LED technology, ensuring the flashlight remains bright as the battery discharges its power over time. Each Bushnell Pro light is simply identified by their highest lumen output (my 350L light has a maximum lumen output of 350 lumens). There is an intelligent switch allowing for momentary on and the transition between lighting modes by half presses of the tail cap activation button. Once the desired lighting function is illuminated a full press of the activation button locks in the lighting selection. Bushnell Pro flashlights offer Cree LED lights using advanced circuitry. 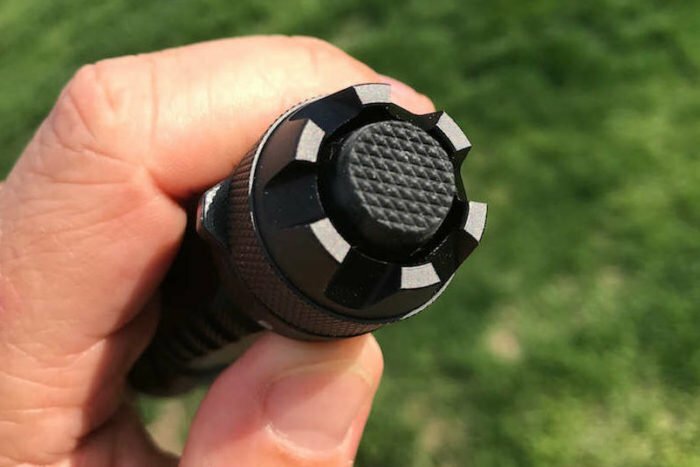 The Bushnell Pro tail-cap button is easily manipulated, though the machined cap can be rough. 1500 lumens (USB rechargeable) – (3) CR123A option. Bushnell Pro’s lock-out lever is a rather unique and beneficial feature. One of the truly beneficial features of the Bushnell Pro flashlights is the electronic lock-out dial located at the base of the tail cap. This lock-out is a slide function, with small tactile tab for easy touch movement. Sliding the lock-out to the locked function prevents accidental activation of the light to save battery life. This is a great feature when officers are sitting in their cars, a time when accidental illumination often occurs. The machine-textured grip provides a solid gripping surface under many poor conditions, but is also a potential uniform killer. The castle-cut bezel protects the lens, and can double as a window-break surface. The activation button is easily manipulated, but the sharp castle-cut tail cap is unnecessary and can be rough on the thumb during repeated use. The Bushnell Pro flashlights are nicely packaged listing key features. 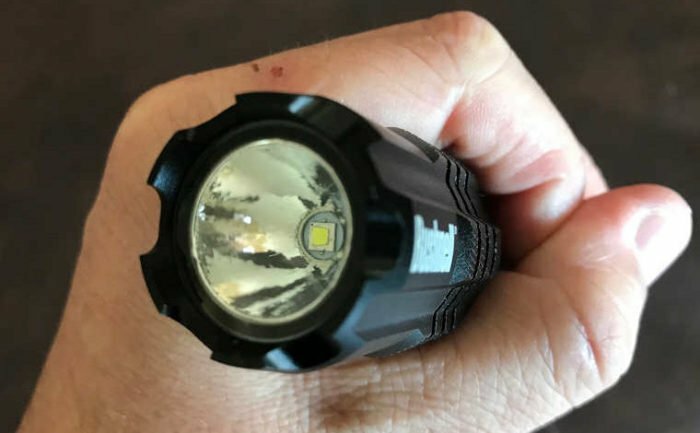 MSRP: $34.95 (for 350 lumen light). Impact resistance is rated to 1-meter, and the Bushnell Pro lights are tested to ANSI FL1 standards. A pocket clip is included in case your duty belt is too full, or you’re not needing this light for “tactical” purposes. The Bushnell Pro flashlights are powered by AA batteries for the lower-lumen lights, and then transition to common CR123A lithium batteries and rechargeable batteries for the brighter lights. Batteries are included with each light. 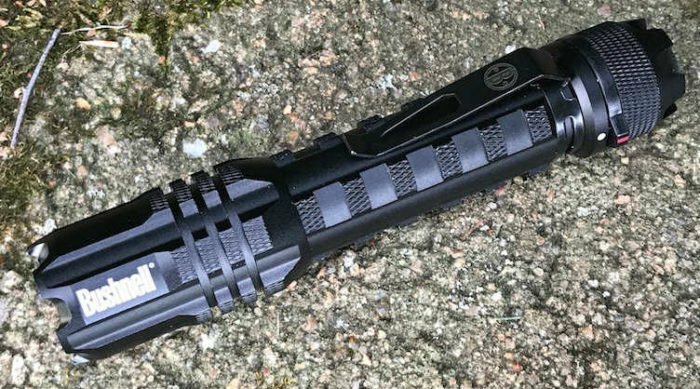 My Bushnell Pro 350 lumen flashlight offers a 3-hour run time on high setting, while throwing out a 146-meter (480 foot) beam with a decently focused beam. Peripheral lighting is also adequate for seeing the bigger picture in low-light conditions. My Bushnell Pro on high (350 lumens) has a nice tight beam, with ample ambient lighting in near dark. 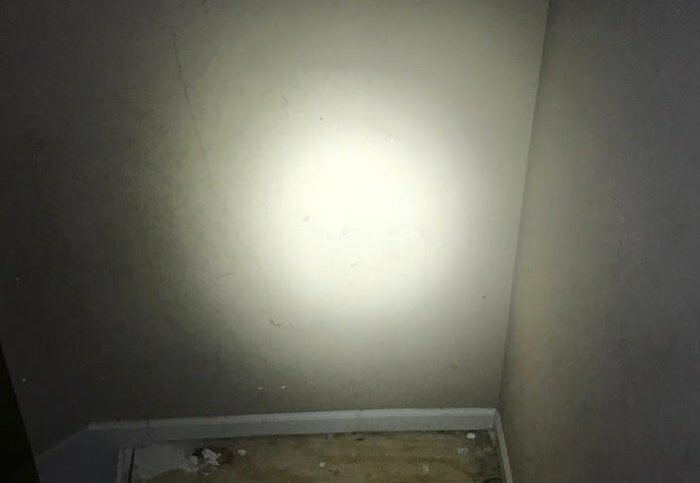 Even on low-setting, the 42 lumens were sufficient to light up this near dark stairwell. The Bushnell Pro flashlights have several nice features, including a lumen intensity range that is fantastic. The aircraft-grade aluminum construction, drop-resistant to 1 meter is very important for duty use, and well built. The advanced circuitry and Cree LED technology is very important for beam integrity and light longevity over the life of the batteries. The beam is concentrated enough to perform well at distance, while still providing adequate ambient light for peripheral vision in low-light conditions. The lock-out lever is a particularly nice feature for carrying lights in open-topped pouches or carriers where the tail cap button can be inadvertently activated. I can’t tell you how many times someone has told me my light was on in its belt carrier, or I felt the heat building up from prolonged run time without my knowledge. The Bushnell Pro machine-textured grip is both a good and bad feature. On the negative side there are a few features we must discuss. The machine-textured grip is meant to provide a solid grip under a variety of poor conditions. Though it accomplishes this task without being too rough for the hand, I cannot say the same for uniforms. Any part of the handle left exposed will quickly tear up a uniform shirt (or pants pocket). This alone is almost an on-duty deal breaker for me. The castle-cut tail cap looks kinda nice, but the unnecessary machining creates sharp edges rough and annoying to the thumb during prolonged use. The lock-out function is a great feature, but requires more awareness on the end-user’s part. 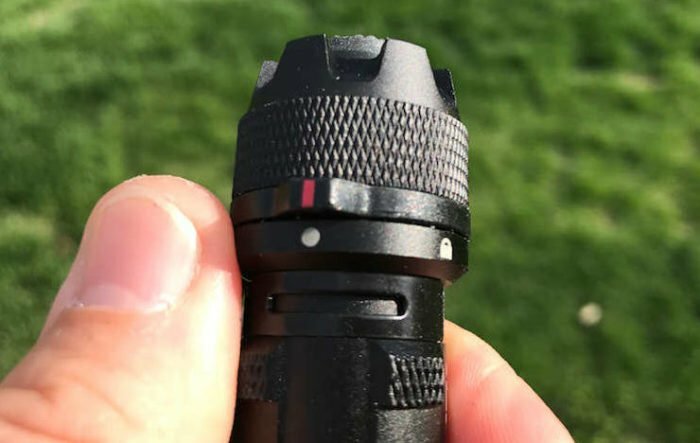 Active use and manipulation of the flashlight can inadvertently slide the lock to the “on” position, leaving a law enforcement user in dire straights with a light that is temporarily out of service when the need is paramount. With all these observations in mind, I have relegated my Bushnell Pro 350L flashlight to a back-up light in my go-bag. It’s great to use on crash or crime scenes that are more static and stable, allowing me to keep the tactical flashlights on my duty belt with fresh batteries. Thank you Sgt. Aaron for your service. If you have any advice for someone my age and just beginning their career in law enforcement at 44 y/o, I would greatly appreciate it. I have a B.A. in Crim. w/minor in Sociology. I lack writing my thesis from having my masters in Criminal Justice. Thank you for your time. Courtney, Congratulations on being so close to your Master’s degree. I hope you finish soon. Beginning LE later in life has its own unique sets of challenges and rewards. On one hand you have enormous life experience allowing you to relate well with the citizens you will interact with on duty. In addition, your maturity should help you overcome some of the “rookie” officer jitters that can sometimes lead younger officers to appear out of control. The challenges will be to learn a whole new career later in life, and a career with very dangerous consequences when you get something wrong. Another challenge will be to accept the advice/criticism of your actions from other officers much junior in age, but with more LE experience. We have had several middle-aged officers come on our force, and have worked out very well. Several were retired military, some were in other industries and just always wanted to be a police officer. It can be done, so be positive and willing to learn.